The user of an information system rarely knows exactly what he is looking for, but once shown a piece of information he can quickly tell whether it is what he needs. Query tuning is the process of searching for the query that best approximates the information need of the user. Typically, navigation and querying are two completely separate processes, and the user usually has to switch often from one to the other–a painstaking process producing a frustrating experience. In this paper, we propose an approach to query tuning that integrates navigation and querying into a single process, thus leading to a more flexible and more user friendly method of query tuning. 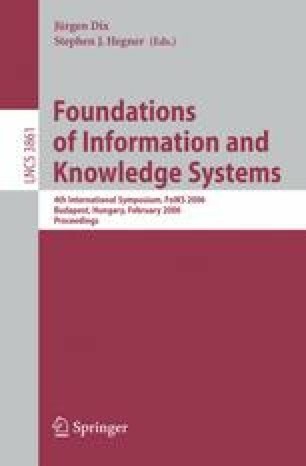 The proposed approach is based on formal concept analysis, and models the directory of an information source as a formal context in which the underlying concept lattice serves for navigation and the attributes of the formal context serve for query formulation. In order to support the user in coping with a possibly overwhelming number of alternative query tunings, preferences are introduced.